Sitting barefooted, Shehzad strums an acoustic guitar – the notes of which are uplifting, soft loops. The bare room is coloured cream, and on the wall behind Shehzad, a green blackboard hangs, the words ‘Believe in equality in education’ are chalked, on the board’s centre. And for a while, you’re led to believe Roy’s song, ‘Ao day dain inhain zindagi’, is simply an instrumental one, but then as the melody dips slightly – aiming to rise again to a crescendo – the camera pans to the right, and there, in all her glory, Abida Parveen begins to sing. 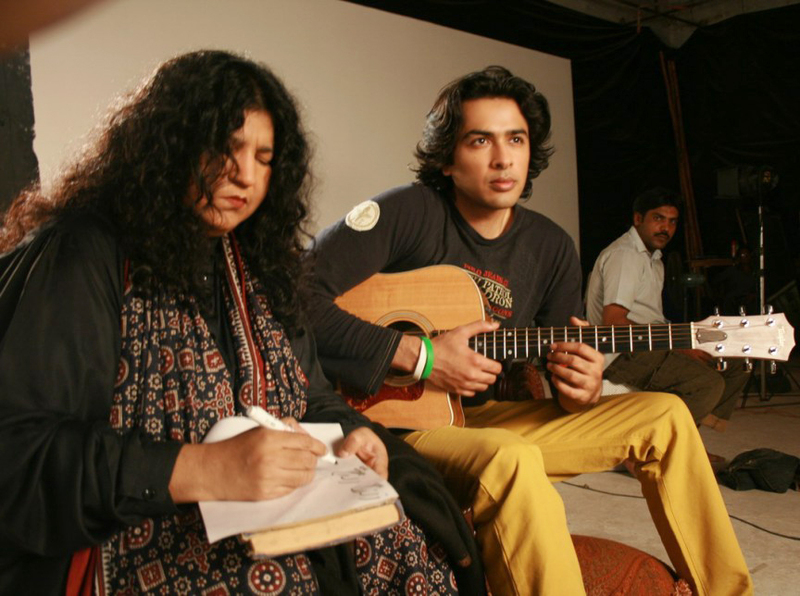 Seated on a divan/couch of sorts, and dressed in her traditional kurta and Sindhi dupatta (strapped around the neck so that the ends rest frontward), with her frizzed curls left loose, her throaty vocals (truly built for singing Sufi qalams) aid in giving the song’s acoustic sound a sense of powerful virtuosity. And interspersed between the video are shots of children (Roy’s ‘Zindagi Trust’ students) holding a globe, playing with an abacus and then towards the end, playing catch with Shehzad on the beach – and as the video draws to a close, the words: ‘No differences can only make the difference’, appear. Roy’s brainchild, the ‘Zindagi Trust’, aspires mainly at educating underprivileged children bound by labour obligations. And essentially, its project called ‘I am paid to learn’ is self-explanatory – the children are paid a daily stipend of twenty rupees in exchange for the time that they take out from their labour jobs to study at nearby ‘Zindagi Tust’ established schools in their vicinity. “Currently we have around 2,500 students in 51 schools across Pakistan”, Roy states. “The project is doing well but there is so much to be done for the education system in Pakistan. I realized that by educating a few students, one could not substantially change the state of education in Pakistan. Education lies with the state and the overall educational scenario will not improve till we improve our government schools. In Pakistan we have multiple education systems hich are fuelling classification in the society…and rich and poor kids can’t even interact because there is no equality in education. We have already started work on improving a government school. The message we want to send across through this video is ‘Equality in Education’”. Roy’s video has been collaboration with UFONE and a sub-title requesting viewers to send in blank SMS’s (which are in actuality ten rupee donations to ‘Zindagi Trust’ per SMS) to a three-digit number, runs at the base of the screen from start to finish. The song, ‘Ao day dain inhain zindagi’, is a pretty one, and the video honest – managing to get its message (of eradicating class boundaries from the system of education) across significantly well. With his quiet and rather detached demeanor – from all things ostentatious and glitzy – Roy is somehow taken more seriously each time he launches a patriotic song or a public-service message through a music video. His work is considered earnest and genuine only because, along with being a consistent artist, Roy’s also been steady, consistent and conscientious concerning his social work. The two go hand in hand.